Vaginal rejuvenation, skin rejuvenation, surgical, and RF Microneedling. Adjustable down to .1mm pitch, fractional CO2 that stimulates continuous collagen. Treat bigger lesions smoothly irradiating up to 10mm diameter. The ultimate skin rejuvenation procedure. Utilizing RF energy and Needles, control the depth of penetration. Vaginal Rejuvenation tip & SUI stress urinary incontinence hand pieces to complete the ultimate multi-function CO2 system. Gynecological Rejuvenator Vaginal rejuvenation, stress urinary incontinence improvement, whitening of labias, vaginal dryness improvement, vaginal atrophy improvement, vaginitis improvement, sexual satisfaction improvement. Cellene has the storage capacity to hold the multi-functional attachments for safe keeping. Not limited to side handpiece holder, side storage, and the front storage compartment pictured. The hand pieces are attached directly to the ARM and the user replaces conveniently just TIPs without separating the HP. This simple & easy connectivity helps lower the optional HP & TIP cost and increases control. What treatments does Cellene Provide? Cellene has 4 modes making it the most versatile CO2 system available. Fractional Mode – full face skin rejuvenation, scars, large pores, wrinkles, full face skin resurfacing. Vaginal rejuvenation, stress urinary incontinence improvement, whitening of labias, vaginal dryness improvement, vaginal atrophy improvement, vaginitis improvement, sexual satisfaction improvement. What laser wavelength is Cellene? CO2 10,600 nm wavelength belongs to far-infrared radiation that possesses high absorption of water and generates heat. It absorbs high amounts of water content which makes CO2 good for incises, evaporates, and coagulation of tissue. CO2 laser can shoot with high accuracy due to low reflection and scattering. What is Radiofrequency (RF) and how is it used with needle? Radio Frequency (RF) is electromagnetic waves from 1mm to 100km – namely, frequency from 3Khz to 300 Ghz and Microneedle RF can transmit energy to the dermis by RF through microneedle. The electrical energy of the RF is converted into thermal energy and transferred to the dermis through the needle to induce dermal coagulation which is excellent for skin regeneration. Regardless of skin type, the treatment is not affected by chromophore, the depth and energy of radiation can be adjusted depending on the range and lesion to be treated. 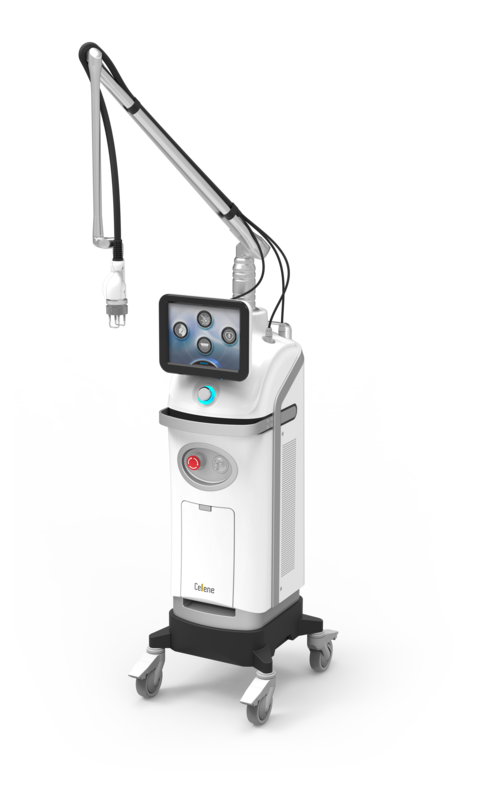 Scan RF Tip – Fractional CO2 laser and Bipolar RF are used simultaneously to delivery thermal energy to the skin. It is more effective for wrinkles, scars, and stretch marks treatment maximizing skin regeneration. Scanning mode, Ultra Pulse, or Continuous wave modes are available options in Cellene user interface. CO2 laser can be slected as a circle or rectangle shape and can be irradiated up to 10mm spot size. After connecting the Needle RF hand piece to the main body, you can set the power, time, repeat setting and interval on the needle RF screen. You can also select the length of the needle that invades the skin by turning the depth control on the hand piece. Stamp SUI / VR mode, laser power, time, repeat can be set in OBGY Mode. Especially when selecting the ablation & thermal effect function on the investigation time tab, increases the shrinkage effect of the treatment area by transferring thermal damage after the tissue has been ablative.